Contrary to large parts of the comics intelligentsia who dismiss it by default, and the masochistic fans who dis it but keep coming back for more, I do not want to dump unreservedly on Marvel’s Civil War. Sure, it is easy to make fun of, what with its ineptly handled attempts at political allegory and its amateurish lack of coherence as a story. But, flipside, it actually started out as a rather ambitious effort at creating an intelligent superhero story that did not just preserve the status quo, but actually moved something. This did not really work, but I still think the people behind deserve some credit for trying. It is of course only natural that something written by committee to this degree would end up a mess, and that crossover events stack the odds against good story as badly as hiring Jeph “Commando” Loeb to write for you. However, despite all of this, Civil War ended up being several leagues above such self-important hermetic fanboy dross as DCs latest series of creative crises. I, for one, prefer Iron Man as a proto-fascist government tool over the Elongated Man’s necrophiliac angst, so sue me. I suppose the reason I am writing this is that I can actually see the vestiges of what was initially a good story, beneath the hype and the kibble. Pitting the heroes against each other over ideological differences ain’t a half-bad idea. Superheroes are embodiments of ideas, and it is to a large extent their archetypical usefulness for the exploration of same that make them interesting as literary devices. And making the conflict the both timeless and timely – and arch-American – one of government autocracy vs. individual liberty, was rather clever. Even daring because it entailed taking a clear stand if the story was not to end up a total cop-out. That characters were killed as consequences of the choices made by the primary antagonists in the story followed naturally from this, and – contrary to the deaths in most “event comics” – actually made a lot of sense in the story (just a pity that the characters in question were predictable redshirts). The Stamford event as a trigger of the story provided an apt parallel to current events with similar consequences (though it also fostered the singularly idiotic Penance, a new and improved, “dark” version of chipper Ditko character Speedball, outangsting DCs perpetually grieving rubber man). Putting the quintessentially compromised vigilante, Punisher, in a central role was a natural choice (but why he was immediately trusted enough to be allowed uzis at Captain America’s strategy meeting is fairly baffling). Having the Marvel everyman, Spider-Man, change his allegiance over the course of the story was an apt human anchoring device that unfortunately got drowned out by the din. And having the Fantastic Four break up over the issues at stake was also inspired, but will certainly mostly be remembered for resulting in some of Mark Millar’s worst writing ever. So yeah, I think Civil War was a fine superhero story derailed by too many chefs too far into the process. Paul O’Brien displays his usual analytical insight when he points out how the single most ludicrous component of the story – the thoroughly unnecessary and absurd Thor clone (or is it a cyborg? even the writer does not seem to know) that turns up halfway through – is so obviously the result of a panicky last-minute patch-up at editorial level. This is the kind of moronic excresence you get when you try to write a coherent story by committee, and across dozens of titles. That, and a central series that is at best short of breath, and more often than not decidedly muddled, because the full reading experience it is made dependent on x number of crappy tie-in/spin-off comics. A pity, because the ending was actually better than it has been credited for in the blogosphere. 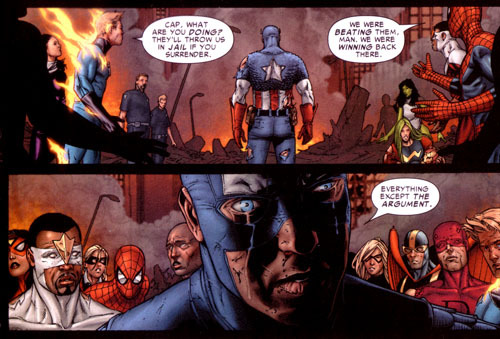 Captain America remembering his vocation, recognizing his symbolic fibre and surrendering, making idealism the loser in the civil war, was a good, committed ending. God knows it could have been handled better though. Why on Earth did he, master strategist that he is supposed to be, decide that downtown New York city would be a good place to duke it out with Iron Man and his crew? I guess it is like Godzilla and Tokyo, but was it really that hard to arrive at something more convincing here? The frustrating thing is that Millar actually can write entertaining, epic and reasonably intelligent superhero comics. Despite a couple of minor flaws, the Ultimates is the character-driven, grand superhero epic Civil War should have been. It never ceases to amaze me that some of these writers can write perfectly good stories in one place, and total drek in another. Millar’s track record is full of such inconsistencies (Wanted, anyone? ), and Brian Bendis – who one the one hand wrote a fine Daredevil, on the other was responsible for the utterly inept Avengers: Disassemble – is another egregious example. It would be easy to conclude that it is in the nature of corporate comics that things work out this way, but that would absolve a lot of lazy writers of their responsibility. Something further that puzzles me: Why is Steve McNiven so universally hailed as a great artist? Yes, his style is sleek and he has a flair for drama, but all his characters look like they are shrinkwrapped, his facial expressions are more often that not out of sync with the writing and strangely photo-like in their frozenness, and his action sequences look like they have been drawn after posed department store mannequins. And what is with this monomaniacal use of pagewide panels? Despite Millar and McNiven’s failings, the failure of Civil War must however ultimately be blamed at editorial. A few years ago, when Joe Quesada was starting his tenure as Marvel’s new editor-in-chief, and partnered with the often dumb, but refreshingly iconoclastic Bill Jemas, the company was actually producing some of the best superhero comics in decades. Of course this could not last, and now we are back to the event-driven schlockfests of the 90s. Just like DCs various committee-written train wrecks of the moment, the prime motivation of the editors seems to be keeping things running in a perpetual loop, one “event” sets the stage for the next, until the manure stops sticking. Not surprising that aforementioned comics intelligentsia is so busy writing obituaries of the superhero genre at the moment. Civil War is frustrating because it actually seemed like it was going to be an exception to the rule, at least to some of us naifs. Where I could care less about most “event” comics, I was actually frustrated by this one, and I take some heart in that. There was actually a much better story fighting to get out from behind the tacky writing and editorial white noise. 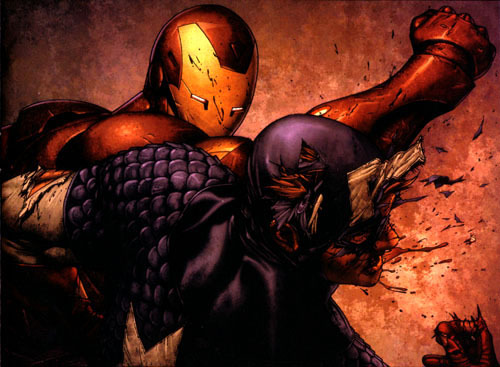 Images from Civil War #3 & 7, drawn by Steve McNiven and assorted inkers & colorists.